We Mean Business > Diversity awards are not bad; they just must be kept in proper perspective. 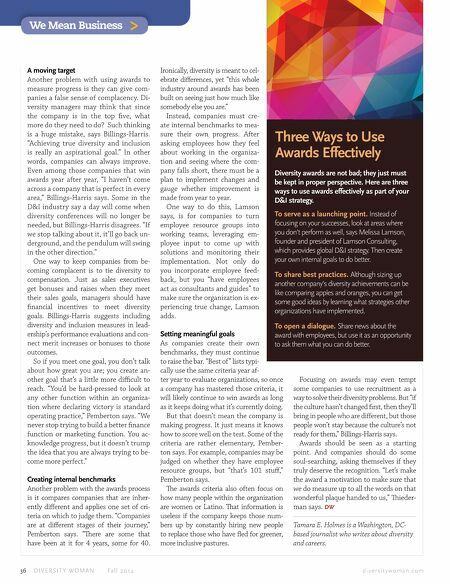 Here are three ways to use awards effectively as part of your D&I strategy. To serve as a launching point. Instead of focusing on your successes, look at areas where you don't perform as well, says Melissa Lamson, founder and president of Lamson Consulting, which provides global D&I strategy. Then create your own internal goals to do better. To share best practices. Although sizing up another company's diversity achievements can be like comparing apples and oranges, you can get some good ideas by learning what strategies other organizations have implemented. To open a dialogue. Share news about the award with employees, but use it as an opportunity to ask them what you can do better. Three Ways to Use Awards Effectively 36 D I V E R S I T Y W O M A N Fa l l 2 0 1 4 d i v e r s i t y w o m a n . c o m A moving target Another problem with using awards to measure progress is they can give com- panies a false sense of complacency. Di- versity managers may think that since the company is in the top fve, what more do they need to do? Such thinking is a huge mistake, says Billings-Harris. "Achieving true diversity and inclusion is really an aspirational goal." In other words, companies can always improve. Even among those companies that win awards year after year, "I haven't come across a company that is perfect in every area," Billings-Harris says. Some in the D&I industry say a day will come when diversity conferences will no longer be needed, but Billings-Harris disagrees. "If we stop talking about it, it'll go back un- derground, and the pendulum will swing in the other direction." One way to keep companies from be- coming complacent is to tie diversity to compensation. Just as sales executives get bonuses and raises when they meet their sales goals, managers should have fnancial incentives to meet diversity goals. Billings-Harris suggests including diversity and inclusion measures in lead- ership's performance evaluations and con- nect merit increases or bonuses to those outcomes. So if you meet one goal, you don't talk about how great you are; you create an- other goal that's a little more difcult to reach. "You'd be hard-pressed to look at any other function within an organiza- tion where declaring victory is standard operating practice," Pemberton says. "We never stop trying to build a better fnance function or marketing function. You ac- knowledge progress, but it doesn't trump the idea that you are always trying to be- come more perfect." Creating internal benchmarks Another problem with the awards process is it compares companies that are inher- ently diferent and applies one set of cri- teria on which to judge them. "Companies are at diferent stages of their journey," Pemberton says. "Tere are some that have been at it for 4 years, some for 40. Ironically, diversity is meant to cel- ebrate diferences, yet "this whole industry around awards has been built on seeing just how much like somebody else you are." Instead, companies must cre- ate internal benchmarks to mea- sure their own progress. After asking employees how they feel about working in the organiza- tion and seeing where the com- pany falls short, there must be a plan to implement changes and gauge whether improvement is made from year to year. One way to do this, Lamson says, is for companies to turn employee resource groups into working teams, leveraging em- ployee input to come up with solutions and monitoring their implementation. 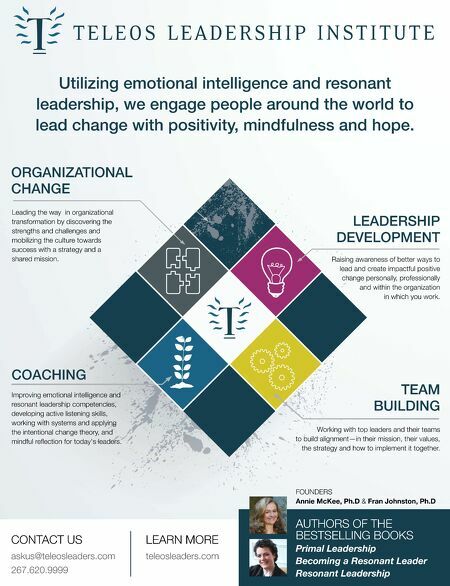 Not only do you incorporate employee feed- back, but you "have employees act as consultants and guides" to make sure the organization is ex- periencing true change, Lamson adds. Setting meaningful goals As companies create their own benchmarks, they must continue to raise the bar. "Best of " lists typi- cally use the same criteria year af- ter year to evaluate organizations, so once a company has mastered those criteria, it will likely continue to win awards as long as it keeps doing what it's currently doing. But that doesn't mean the company is making progress. It just means it knows how to score well on the test. Some of the criteria are rather elementary, Pember- ton says. For example, companies may be judged on whether they have employee resource groups, but "that's 101 stuf," Pemberton says. Te awards criteria also often focus on how many people within the organization are women or Latino. Tat information is useless if the company keeps those num- bers up by constantly hiring new people to replace those who have fed for greener, more inclusive pastures. Focusing on awards may even tempt some companies to use recruitment as a way to solve their diversity problems. But "if the culture hasn't changed frst, then they'll bring in people who are diferent, but those people won't stay because the culture's not ready for them," Billings-Harris says. Awards should be seen as a starting point. And companies should do some soul-searching, asking themselves if they truly deserve the recognition. "Let's make the award a motivation to make sure that we do measure up to all the words on that wonderful plaque handed to us," Tieder- man says. DW Tamara E. Holmes is a Washington, DC- based journalist who writes about diversity and careers.